I’m, like, so sick of pizza, dude. But I ate it anyway (SEVEN MORE LUNCHES TO GO). It tasted ok. I’m trying to think positive now. I’m mostly successful. Today I felt a lot of joy. I’m trying to figure out what made me so happy. 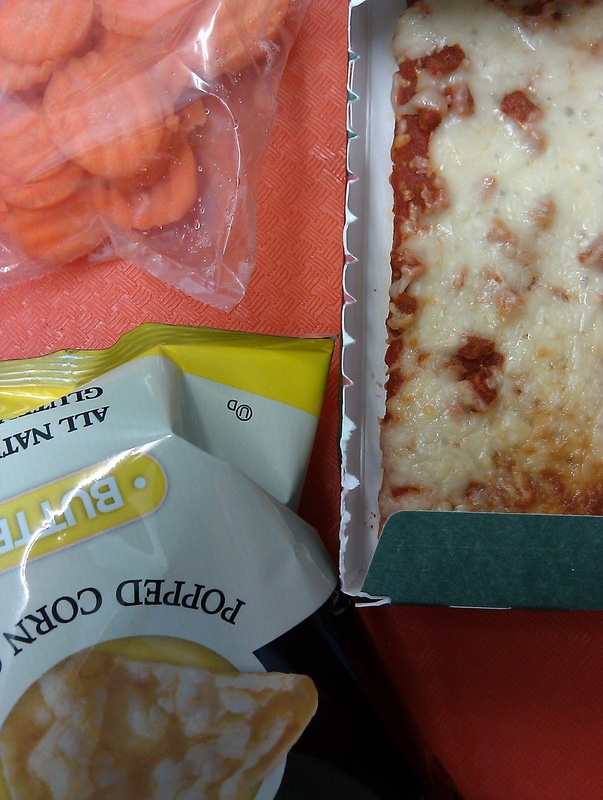 I think a lot of it is that eating school lunches is almost over. I really believe that not having control over the food you eat screws up your brain. The psychology of not controlling what you consume, day after day, well, it has done a number on me. Someone should do some research into that and get a PhD. When you are stuck with something for so long…with no escape…you have to embrace it. Also I have a good friend at work that I realized recently just makes me happy. He is a kindred spirit (don’t worry, he’s gay). A long time ago a dear friend told me, “I’m happy just knowing that you are in this world.” That’s exactly how I feel about this coworker. I feel so lucky to have him in my life, but especially where I work. So the fruit cup didn’t make it into the first shot. I have a confession to make: I position the food on the tray just so. I took the fruit cup off and I didn’t put it back on. I guess you could say I “style” it, but really it’s nothing that elaborate. The popcorn chips were eh, but the carrots were better. I ended up running out of time to eat the fruit cup so I ate it at the end of the day. I forgot to share with you that one of my students was sick after yesterday’s lunch (sloppy joes). She complained that her stomach hurt late afternoon within 30 minutes of dismissal. This particular student has a sensitive stomach. I wasn’t sick from yesterday’s lunch, but I did have random discomfort both yesterday and today. I used to never notice how my body felt after eating, but now I do. My son’s lunch starting at the biggest compartment from bottom left, counter-clockwise: potato soup (Imagine brand with purple & white potatoes added by me), tuna in the silicon cupcake, packaged brown rice marshmallow bar; peeled clementine, crackers, packaged rice cheese (under crackers), sliced avocado and sliced red bell pepper. 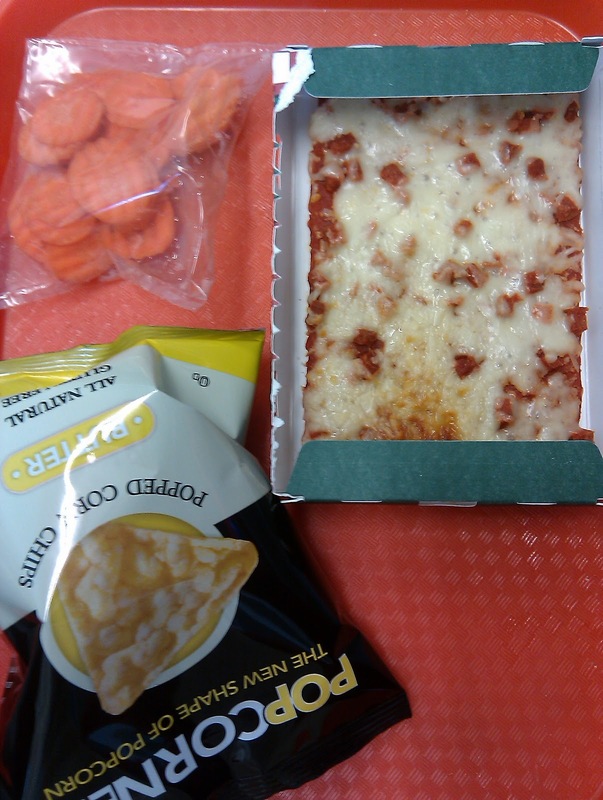 I totally deviated from the regular lunch the kids are getting today. Their menu consisted of diced ham with buttered whole grain noodles, green beans, and bananas with “fruit” and american cheese slices on crackers as snacks. The only thing I said he can eat with the kids was the banana.) I wanted my soup lover to get some soup. I buy the “Imagine” brand from Whole Foods. It’s gluten free, but when you read the back it has a huge list of things that it doesn’t put into their soup. I’d really love to make my own soup and maybe next year I’ll get the chance, but for now this is perfect. I tasted the soup before I put it into his lunch and I thought it was peppery. I like their tomato soup as well as their squash soup, but this didn’t do it for me quite as much. I was running low on time so I dropped a couple sliced purple and white potatoes into it to give him something to break up the texture. I like to eat tuna on crackers with soup. So I sent tuna and crackers for my boy. The clementine is peeled, but he likes to rip it open his “own self.” Under the crackers is something called “rice cheese.” It looks exactly like the pre-packaged singles that they give out at daycare for snack (I know, before I investigated I thought it was plain old sliced cheese, but it’s even more processed). The rice cheese is dairy free and soy free. I haven’t tasted it, but my son loves taking the cheese out of a package and gobbling it down much to my own chagrin. Lastly I sliced up some avocado and a mini-red pepper. I bought some vegetable cutters that cut veggies like peppers into little shapes and sent along pepper shapes in his lunch a week ago. His caregiver said that he didn’t touch them because he didn’t know know what they were. At home he likes to chew on the pepper and crunch it, but I’m not sure I know how much he actually eats. So I sent it just sliced this time. I believe it’s important to play with foods at this age. Eating should be a sensory experience! His main caregiver was absent today too so I didn’t get a straight answer about what he ate. I guess he didn’t eat everything, but no one could tell me exactly what he didn’t like and didn’t eat. I walked in and he was eating Cheerios with the other kids! Oh jeez. The morning there were two staff members and in the afternoon there were two different people. I hope his main, regular caregiver comes back soon because this is not good. I’m going to have to formalize the fact that he doesn’t eat wheat or dairy. I’ve been dragging my feet on it because I think it will require a doctor’s note. The two main caregivers know it, but if there’s an absence, it all goes out the window. I’ve been a big fan of Laptop Lunches ever since I read Vegan Lunch Box a long time ago. If you are considering buying Laptop Lunches as a holiday gift, I suggest buying the Bento Kit as well as an extra package of the replacement interior boxes. That way if you are in a rush and you don’t get around to washing the lunch containers from one day, then you are covered because there are clean ones at the ready in the cupboard. They are in constant use for my son’s food. My son’s lunch’s cost calc? Well, I don’t know. It’s not about the money: it’s about health. I like my husband’s philosophy of grocery shopping: it’s not wasteful if you are going to eat it. 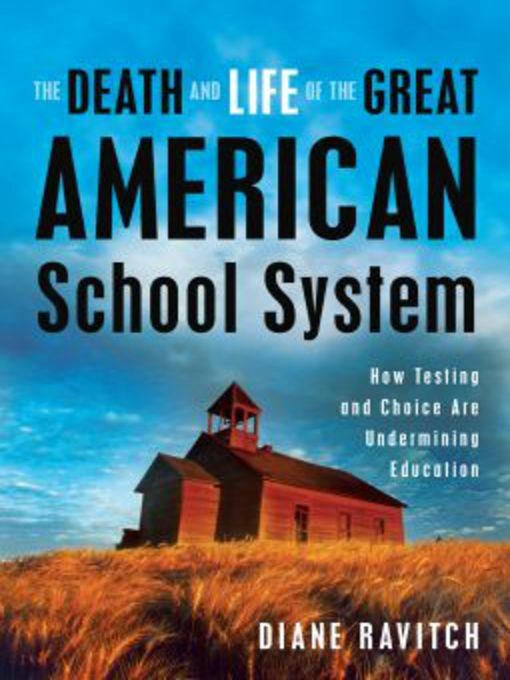 My copy of The Death and Life of the Great American School System. This is a very interesting book, but one that I haven’t had the time to finish (wonder why) and I think you will enjoy it immensely. Anyone who participates is eligible, even if you are only able to participate for one day this week. Winners to be announced next week. Here's the link to my $2 Lunch Challenge: Day Three. I couldn't find the "Submit a Link" section, so I posted it here. I don't think I ever ate a red pepper plain. I should try it. I love your commentary about your son, probably b/c he reminds me of mine. I can hear in your "voice" how much you love him! Random thoughts: Interesting that you aren't allowed to send grapes, but mini tomatoes are okay. They seem as though they'd fall in the same "choking hazard" category (I use quotes b/c I disagree, btw). Looking forward to next week! Are you going to do a big reveal????? Also, Thanks for doing this blog. You've really changed the way I look at food (and I was already a fairly healthy eater), and most importantly, helped me set the foundation for better nutrition for my son. I like that grocery shopping philosophy! Sadly enough, though, there are many families who can only eat what they can afford. As a preschool teacher (with Celiac disease), it horrifies me that this is the second day your child was eating gluten!! I don't know if you said that he just has a gluten intolerance or actually Celiac's but he should absolutely NOT be getting something he is allergic to at school! If he does have Celiac, then eating gluten would be causing damage to his body! Even if he is just intolerant, there is no way the teachers should be giving him gluten, especially since you work so hard to send him with appropriate and healthy lunches and snacks! food, food all over the world.., i love foods.., to intake to gain a positive thoughts..
re your comment that "The psychology of not controlling what you consume, day after day, well, it has done a number on me. Someone should do some research into that and get a PhD. When you are stuck with something for so long…with no escape…you have to embrace it." 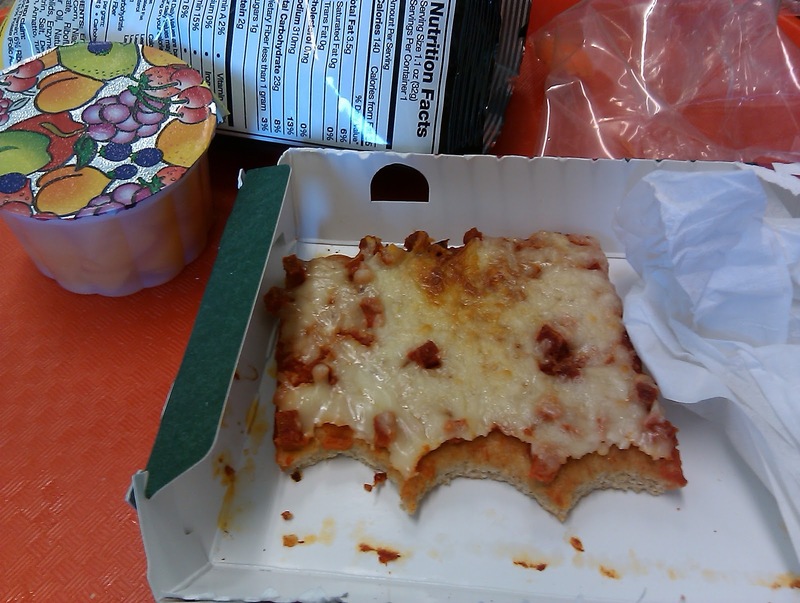 Is it just me or is pizza being served more & more often at your school, Mrs. Q?? Love that you're going to make your own soups! It's so easy – I made curried butternut squash the other night and I could control the spice level and everything else I put in it. I remember a special project when I was in kindergarten – we made soup! I remember frozen vegetables but don't remember what else we put in it. I do remember that it was neat to learn that soup wasn't just from opening a can – might be a fun project for your own students! "The psychology of not controlling what you consume, day after day, well, it has done a number on me. Someone should do some research into that and get a PhD. When you are stuck with something for so long…with no escape…you have to embrace it." I've also been wanting to say kudos for sticking to your guns in providing your son's lunches/snacks. We provided our daughter's snacks all through preschool, not because of allergies, but because of nutritional quality. And she now goes to a school where all the kids provide their own snacks and lunches (there is no cafeteria). Not once have we ever regretted these decisions. I think too often people worry about their children feeling "different," but we decided we'd rather teach our daughter that it's OK to make different food choices. The world is filled with differences. Food doesn't have to be some weird, conformist exception. My kids would not eat cold soup. So, we have 2 lunch sets for each kiddo. In regard to your philosophy on grocery expenses, I have a similar one. Whenever I am paying what I feel like is a lot for good quality food I remind myself that "This is an investment in my health." What could be more worthy of investment than that? Your son's lunch looks great! I love Imagine soups too. I have found that if I slice avocado and wrap it in plastic wrap it prevents it from browning as fast. I am so happy for you that you have only a week left. I have really enjoyed all parts of your blog. After your night time experience from eating school pizza last week, Mrs. Q, I think you were mighty brave to eat this pizza. I used to eat canned soup almost every day all winter long, including Imagine brand. Once I got in the habit of making and freezing my own, I can't abide the canned stuff. It's all so salty, even the "low sodium" stuff, and has that "tinned" taste which really stands out to me now that I don't regularly eat canned soup. I think it was worth the effort to learn to make my own repertoire of homemade soups. I love the instructions you tack to the inside lid of your son's lunch box! It's one of many signs of a mom who cares. So sweet. Does the Imagine brand tomato soup have dairy? My son loves tomato soup but I haven't found one yet that doesn't have milk. It would be worth a trip to Whole Foods to stock up for sure! I am unfamiliar with the blog where the Eat Along Challenge came from but I am in LOVE with the metal lunch box she uses-do you or anyone else here, know where to find it? When my kids used a laptop at school they just left their leftovers in the lunch box. That way I could gage what they liked and didn't like. Some days I could even re-use what they didn't eat. Like the pepper strips could go in my breakfast omelet if it came home in the lunchbox. Both my fiancé and me have the Laptop Lunches bento sets, and I've got one spare set of the interior containers, and they are really invaluable for a lunch for an adult, or a lunch and a couple of snacks for a kid. 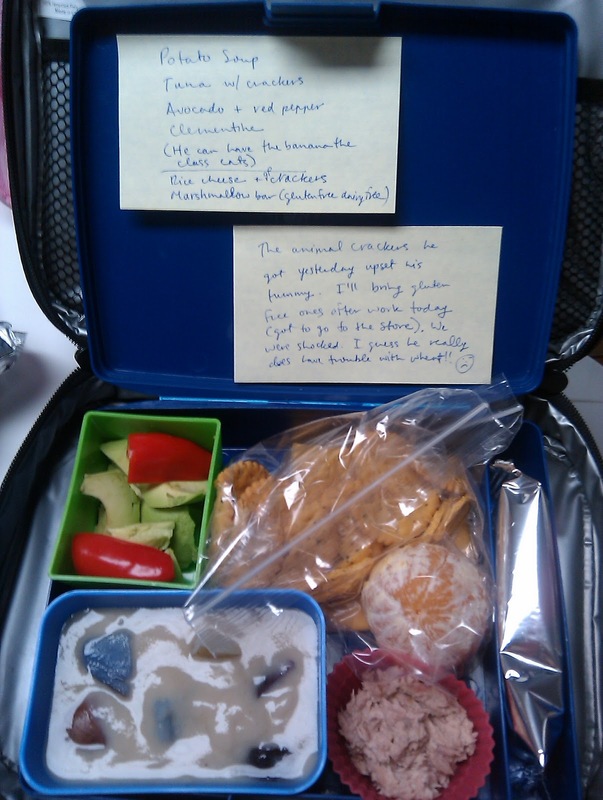 I wholeheartedly recommend those even for adults to pack lunches into. For my part-time job of 6 hours per business day, I pack something a little more compact, most often using one of my Japanese bento boxes I recently got from Japan. They're good for lighter eaters, or in the case of a child's lunches, could potentially hold one snack, one lunch and one "dessert". What baffles me a little about your son's daycare ("BabyQ" perhaps?) is, as one commenter (Allison) already said, is that if your son follows a special diet, that his caregivers are giving him snacks unsuitable for him. Keep bringing it up with the substitute teachers. Even if it means you have to describe his reaction to gluten in such graphic detail to the subs so their eyes pop out of their sockets, make sure they understand why your child can't have crackers and cookies or milk products, and that they get a scary enough version to make the subs pass the warning on to the afternoon shift. Best of luck for getting it sorted out. I feel so bad for reading about this kind of mistakes that don't have to happen. Even if it's not officially a "food allergy", you could ask if they'd want to put a note in the staff's break room mentioning that your son gets ill from eating some food items, and put a list of "off limits" foods on there. The school's policy may officially be to get a doctor's note, but often, you can just agree on some basic rules with the staff. Especially with you sending in the food for your son, Mrs.Q, there's a good chance they're willing to let the absence of a doctor's note slip, since the school doesn't have to provide the special food. Most canned soups have some form of MSG in them … even quite a few organic ones. If you do a google search for "site:http://www.imaginefoods.com/ yeast extract" you'll get a list of the products from that brand with the bad stuff in it. The annoying thing is that the manufacturers know exactly what they're doing: avoiding the bad reputation of MSG while getting the same effects (and side effects). When my kid was in day care and went gluten-free and dairy free, they did require a note from the doctor. At every place. And they never did get it consistently because every time there was a sub, there was a flub up. Hated it. oh look! I found a site with the motherload! mrs. q, be careful with the fake dairy–a lot of products are full of trans fats.